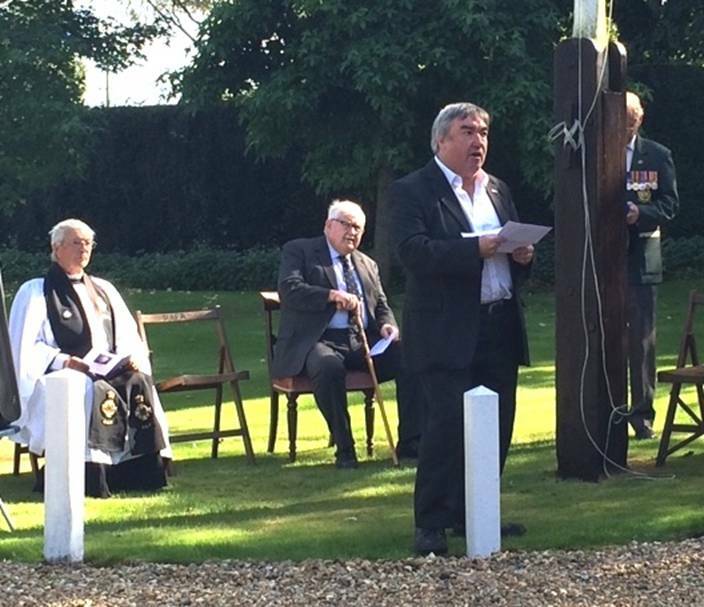 SPEECH GIVEN BY A.D.HARVEY AT THE "RAISING OF THE FLAG" CEREMONY IN NORFOLK ON 11th SEPTEMBER 2016. Once again this year I consider it a very great honour to be invited to address this inspiring ceremony. Since I spoke here last year a lot has happened in the world, which excitingly has mainly proved to be very good news for the British and British-descended people around the globe. There has, alas, been one very retrograde development during the last twelve months which has angered and outraged all British patriots, and those with Rhodesian roots and connections in particular. This has been the so-called “Rhodes must Fall” campaign, initially orchestrated by malcontents from the University of Cape Town (those who Rhodes’s great contemporary and admirer Rudyard Kipling once termed “the lesser breeds”) whose aim has been to obliterate all statues and memorials to Cecil John Rhodes from the once great educational establishments of the “new” South Africa. Under its current dispensation this campaign was predictably successful within the “new” South Africa itself, but it then sickeningly spread to Oxford University where similar low-life - who should never have been allowed to enrol in the University in the first place - tried to ape their primeval “new” South African counterparts. Happily the authorities at Oxford University displayed more backbone than their academic equivalents in the “new” South Africa, and the demands to remove the statues and memorials to Rhodes at Oxford were dismissed out of hand. But what is it about Rhodes that makes our enemies so fearful of his glorious legacy some 114 years after his death? Surely therefore it is time to remind ourselves afresh of his life and achievements. I regard Cecil John Rhodes as being one of the greatest people who Britain has ever produced. He is one of two historical heroes of mine who I’ve been honoured to have visited both their place of birth and their grave (the other being Lord Carson – Sir Edward Carson). Cecil John Rhodes was born at Bishops Stortford in Hertfordshire, the son of an Anglican clergyman (by being the child of a clergyman this of course puts him in the same category as our new Prime Minister and my own dear late wife), and had both English and Scottish blood in his veins. Although academically brilliant at school, and a keen sportsman (being especially keen on Cricket and Athletics, particularly throwing the javelin) he was unfortunately quite sickly as a child. This actually turned out to be a blessing in disguise, for his brothers Frank and Herbert had earlier been bitten by the Imperial pioneer spirit and had moved to the African colonies, and Cecil was sent out to Umkomaas in Natal, where Herbert had established a cotton farm, in order to build up his strength. Almost immediately upon arriving Cecil realised what his life’s mission was to be: “If there be a God” he said “I think what He would like me to do is to paint as much of Africa British red as possible”. Subsequent events of course proved not only that there definitely was a God, but also that Cecil Rhodes fulfilled his mission! Shortly after the discovery of diamonds at Kimberley Herbert left his cotton farm in Cecil's hands and travelled to the Diamond Fields to prospect. With far-sighted common-sense that is a excellent example to modern-day patriots, Cecil realised that his long-term patriotic ambitions could only be accomplished with the aid of a solid financial foundation. It was not long, therefore, before Cecil came to join his brother Herbert, and with a single-mindedness which typifies those who work for higher ideals than mere personal gain, soon made himself one of the wealthiest and most powerful diamond mine owners in Kimberley. With the aid of this financial security he returned to Britain to study at Oxford, commuting each year between the two parts of the Empire in order to keep firm control of his growing business successes in Kimberley. Immediately he graduated, however, he entered politics, being elected to the Cape Parliament in 1881, and by 1890 becoming Prime Minister of the Cape. From this additional position of power he set out to ensure that his next Imperial ambition was accomplished, namely the immediate establishment of a new British Colony north of the Limpopo River. The British Government at the time, alas, proved only luke-warm to this inspired and visionary plan, but Rhodes was not to be discouraged; he established a new "trading" company, the British South Africa Company, and with the aid of a pioneer column of only 580 courageous patriotic volunteers crossed the border from British Bechuanaland into the unclaimed territory on July 10th 1890. In barely two months the brave pioneers had tamed the roving Black tribes of the area, and on September 13th the Union Flag was proudly hoisted over the newly established capital city site of Salisbury. Thus, by the time of his death twelve years later, two countries bore Rhodes' name: Southern and Northern Rhodesia! Not since the days of Alexander the Great had one man been feted with so many new place-names in his honour! Rhodes was not only a British patriot in the national sense, but also in the often controversial context of race. As early as his Oxford days he had remarked to friends at dinner "I contend that we are the first race in the world, and that the more of the world we inhabit, the better it is for the human race. I contend that every acre added to our territory provides for the birth of more of the (British) race, who otherwise would not be brought into existence.". Whilst Prime Minister of the Cape he assiduously made friends with his fellow Whites, the Afrikaners, and it was therefore the ultimate of tragedies that through the intransigence of the Transvaal President, Paul Kruger, and over-hasty action by his great colleague and mentor Leander Starr Jameson, the two great White populations of Southern Africa were set in conflict, which alas culminated in the fratricidal Anglo-Boer War. Rhodes worked steadfastly to avoid this disastrous conflict, but once war proved unavoidable he gave his full support to the Imperial forces. His personal bravery knew no bounds (he had earlier journeyed alone and unarmed to negotiate submission terms with a Black chief in Rhodesia) and he remained in Kimberly for the duration of the four months siege. The tragedy of the Anglo-Boer War also proved a personal disaster for Rhodes; his health deteriorated as a result, and he died prematurely at Muizenberg in the Cape in 1902. His ultimate life's dream, that of British colonies stretching the length of Africa from Cape Town to Cairo, thus remained unfulfilled at his death. In his first Will Rhodes left his entire estate "for the establishment, promotion and development of a secret society, the true aim and object whereof shall be the extension of British rule throughout the world.". Whether such a body was ever actually established has been a matter of historical conjecture, but it is a fact that by the time of his death, with a British Government in power far more favourably disposed towards the ideals of Imperial expansion, Rhodes had altered his Will to provide simply for scholarships to Oxford University for the elite sons of the Empire. Alas, although in the decades immediately following Rhodes’s death the British Empire produced many more great men and women who continued his vision, and indeed the British Empire reached its zenith in the years following World War One, the latter half of the 20th Century saw a rapid and fundamental decline in Britain’s fortunes and position in the world. The British Empire was criminally dismembered, and although the spectre of the British Commonwealth was established in its place this proved only a fig-leaf to hide the treason which the abandonment of Empire entailed. Britain declined dramatically economically as a direct result of the loss of practically all its colonies, and even more frighteningly the chaotic instability of the newly “independent” former colonies caused massive unwanted immigration into the United Kingdom itself, resulting in even steeper economic decline, escalating lawlessness and widespread social unrest. Finally the little men who ruled Britain following World War Two decided to abandon the very sovereign independence of the United Kingdom itself by joining the German-dominated European Union. All this was during the latter half of the 20th Century of course, but I’ve detected that a fundamental sea-change took place at roughly the turn of the Millennium which changed fortunes for the better for not only Britain but for the Western world as a whole – a sea-change which was a mirror-image of the retrogressive sea-change which occurred in the decades following World War Two. I have often been criticised for being too optimistic in this regard, but in spite of a number of set-backs during the 2000s I still stand by this interpretation of events. Furthermore, I believe that the current year, 2016, has already witnessed some of the most encouraging signs yet! Let us look therefore at what has already happened during 2016. The year started with a referendum in one of the great Imperial brother countries so close to Rhodes’s heart – New Zealand – on whether to abandon the traditional design of their national flag, which of course features the Union Flag. All the “received wisdom” from the “chattering classes” was that New Zealanders would vote for this change by a large margin – but in the event they voted to retain their true flag by a massive margin of 13.5%! (Interestingly, shortly after this the Fijian government announced that they would not alter the traditional Fijian flag by removing the Union Flag from it – thus showing that the non-Whites of Fiji appreciate the advantages that benevolent British rule brought to their country, even if the students of the “new” South Africa don’t!). An even more significant victory for the British people was just around the corner however, in the form of the Referendum on the UK’s continuing membership of the European Union. Again the “received wisdom” of the “chattering classes” was that there was no chance that the “Vote Leave” campaign could win – but they did, by 52% to 48%. Perhaps not a landslide, but even so a very significant victory margin of one and a quarter million votes! Many have observed that the fantastic success of the 2012 London Olympic and Paralympic Games gave the British people so much renewed self-confidence in their own abilities to achieve success on their own without being part of some wider EU grouping, that this was a major contributing factor which gave them the self-belief to “Vote Leave”. I agree, and would actually go further by asserting that the subsequent triumphs at the Rio 2016 Olympics were caused to a significant degree by the euphoria generated by the “Vote Leave” triumph. One further point; “Zimbabwe”, that land which was once civilised Rhodesia, won Zero medals at the Rio Games, and as a result Mugabe, the demonic tyrant of that beleaguered land, has now ordered the arrest of the entire national team! The team of the “former colonial master” who he of course constantly maligns won 67 medals – 27 Golds, 23 Silver and 17 Bronze! Cecil John Rhodes was a great Imperial Patriot and a keen sportsman. Had he been alive today he would undoubtedly have been as excited as I’ve been by the positive developments of 2016. I would also like to remind you of another great Rhodesian patriot who is a true credit to the nation which Cecil John Rhodes founded, namely Peter Sladden. By keeping alive the “Raising of the Flag” ceremony for all these years in exile he has done invaluable service to the cause which Rhodes aspired towards. I for one am delighted that Peter has lived long enough to witness 2016, the year when a great nation has arisen again! Rhodes’s dying words were “So little done, so much to do.". It has been the duty of all those who have followed him to continue that which he began. 2016 has certainly shown that our current generation is up to the task – but there is still much to be done. I’ve talked enough, so I’ll shut up. We all now have much work to do!